Spirit Plus Nutrition a division on Spirit Plus LLC is managed and operated by Ron and Shirley Bircher. Spirit Plus Nutrition was established in June of 2001 with a goal to develop a "Natural" line of complete feeds and supplements with our mission "To achieve optimum health through premium-quality, natural-based nutrition". All of our products are available to you through our efficient route delivery system or shipping via UPS. With the delivery routes there is no more back-breaking, lugging of heavy bags, from the store, into your vehicle, then into your feed room, or storage area. We do it for you. This puts us in touch with you and your equine friends. Ron has been in animal nutrition sales, formulating and balancing rations, and custom formulations for horses and cattle feeds for 36 years. He is a strong believer in spending time communicating and educating our customers. The more you know about equine nutrition, the better managers you will be for your animals. Ron also enjoys meeting and looking over your horses. It gives him a better direction for formulating the feeding program. The breed or breeds of horses you have, not all breeds have the same metabolism. The condition of the horses. What the horses are being fed now for grain and supplement. What type of hay or pasture do you have? What is their water supply like? Is there free choice mineral and salts available? What body condition are you looking to have your horses achieve? Ron and Shirley have had horses in their lives for 38 years. 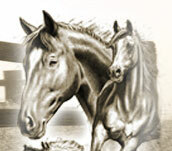 Our horses now are pleasure horses and play a very important part in Spirit Plus Nutrition. We do not put products on the market until we have been able to test and evaluate them through our horses. Spirit Plus Nutrition also carries wood shavings, pelleted bedding, pet foods, mineral and salt products, and more, check out our online store. Another division of Spirit Plus, LLC is Spirit Plus Health, which is a member of Young Living Essential Oils, all-natural therapeutic grade oils that work well in natural healing of animals and their owners. If you are looking for natural ideas to improve a condition that just doesn't seem to be improving, give us a call, or email us. We would be glad to help out. It is our goal at Spirit Plus LLC. To "SERVE YOU". We do this by supplying premium quality products, exceptional service, competitive- delivered prices, and we take the time to listen to your ideas and suggestions. We look forward to building a long-term relationship with you and enriching your relationships with the animals in your life.